« The 1665 Marci Letter: A Forgery? Although I’ve mentioned various aspects of my Modern Forgery Hypothesis for the Voynich Manuscript over the last few years, both here and on the Voynich Mailing List, I have never posted a summary of it. This is an attempt at doing just that. But as a summary, it is necessarily incomplete. It is will not have a detailed explanation of, and supporting arguments for, much of the evidence within it. All of that detail will all be addressed in a future and larger work. This hypothesis proposes that the Voynich Manuscript is a circa 1908 to 1910 work, created by or at the request of Wilfrid Voynich, using materials he found after the 1908 acquisition of the Libreria Francescini, in Florence, Italy. It is also proposed that the work may have been created there, and that it was possibly made from larger sheets of calfskin, cut down to serve this purpose. I further propose that is was created first as a Jacob Horcicky botanical, which was meant to appear as though it was created in the Court of Rudolf II in the early 17th century, and as such was falsely “signed” by him. At some later point (by about 1910/11? ), the intended author and time was changed to Roger Bacon and the 13th century, probably by removing many of the now missing pages (which may have run counter to a Roger Bacon claim). Sometime later, the 1666 Marci to Kircher letter was forged, in order to strengthen this new, intended, Bacon authorship. Among the possible sources used to create the Voynich Ms. were the 1904 Follies at the Court of Rudolf II by Bolton (practically a “primer” for perceived content), The Microscope and Its Revelations, 19th century, by William B. Carpenter, the 1909 Nature Through the Microscope, by Kerr, along with other specific books on microscopy and/or microscopes, certain herbals, botanicals, and more. I also believe that the forger used various known artifacts and works in collections available to Voynich, such as those in the nearby Museo Galileo in Florence, in Paris, Berlin, Rome and London, and other places he was known to have traveled to. A person’s life can be divided chronologically in many ways, but for the purposes of this hypothesis, I have done so based on Wilfrid’s business operations. First phase, 1892 to 1902: During this period, Wilfrid built a successful book business, and developed a very positive reputation as a clever and knowledgeable bibliophile and businessman. At the end of this time, 1902, he sold 150 of rare incunabula to the British Library. They rejected several items, including a curious, and previously unknown, 1522 manuscript map related to Magellan’s voyage. As for this “Magellan Map”, Wilfrid had said he found it in the binding of a 1536 book. I contend that map may be a fake, and that Voynich was aware it was a fake, and that this demonstrates that he had some connection to the world of forgery- at least, to the very active industry in manuscript map forgeries which existed at the time. I also believe it possible that, rather than the time honored claim of his possessing some incredible talent at “sniffing out” unknown manuscripts and incunabula, Voynich actually relied mostly on one source: The Florence Libreria Franceschini, the vast stacks of which provided a large number of his acquisitions during this time. Second phase, 1902 to 1908: This was a bit of a dry spell for Voynich. He did all right as a dealer, but had no great successes. By now his wife Ethel was experiencing an increase in fame and popularity, as a well known author of several books, and as a translator, humorist, and composer. I consider the effect this may have had on Wilfrid as an important motivating force to the choices he subsequently made. The personal implications of “marital hegemony”, is a known cultural phenomenon, and a powerful incentive to push for success. Also during this time, Voynich sold at least one (known) forgery, the Columbus Miniature. It is considered by some a “Spanish Forger” work, but is also sometimes attributed to another unknown forger or shop. From Wilfrid’s somewhat disingenuous sounding explanations as to where he acquired this work, I suspect he knew it was a forgery, and may have even known its true origin. Third phase, 1908 to 1914: This is the era of Voynich’s greatest successes, both economically and popularly. During this time he claims to have found many previously unknown works of immense value, and managed to sell several of them. I feel it is more than coincidental that these successes came soon after his purchase of the vast repositories of the Libreria Francescini, which had mountains of untapped materials… one estimate puts the number at over half a million. Of course Voynich claimed to have found the Cipher Ms. in a “castle in Southern Europe”, and an “Austrian Castle”, and later, the Villa Mondragone in Frascati. There were other works which were also later claimed purchased from the Villa, and several of these have various perturbing scholarly and art history anomalies. I feel these problems imply that some may be forgeries, or at least, have forged elements. I won’t go into a list of them, here, as this is an ongoing aspect of this work, and very involved. I even think it possible that the Libreria was a place where these forgeries were created, even before Voynich purchased it. Perhaps such operations continued after purchase, or maybe Voynich merely acquired these works along with the business. It is known that at least two “forgery factories” operated in Europe at the end of the 19th, and the beginning of the 20th century, producing maps, manuscripts, paintings, carvings in ivory and wood, castings, other metalwork and jewelry. The works of the famous but enigmatic “Spanish Forger”, mentioned above, are considered products of such a factory, of which the location has never been determined. So during this time, and very possibly at the Libreria, I believe Voynich created his magnum opus of forgery, the Voynich Manuscript, using some blank folios he found there. I also think it may be the only work he personally had a hand in creating. And the claim that the use of early 15th century calfskin is evidence that it must be real, because, supposedly, “the experts got it right”, is incorrect: Most experts did not guess early 15th century, before the C14 radio carbon results of 1404 to 1438. In fact, when those results were revealed in the 2010 ORF documentary, they were billed as running counter to previous opinion on the matter. That is, I think the C14 results actually imply a forger’s random selection of a then untestable (for age) stock of calfskin. Fourth phase, 1914 to death: By 1914 Voynich had opened his shop in New York, right across from the New York Public Library. It was during this time that he worked tirelessly to promote his Roger Bacon Cipher Manuscript, showing it, lecturing on it, and passing around photostats to various experts in botany, cryptography, herbals, and so on. By about 1921 the fame of his find was enormous, and it was generally accepted as a Roger Bacon work in the press and popular culture. This was due in no small part to the claims of Romaine Newbold, who famously claimed he could decipher much of it. He believed it contained amazing discoveries and inventions, such as advanced optics capable of seeing details of celestial bodies and microscopic organisms, previously thought discernible only by 19th century optics. This caused an understandable sensation, which in turn caused a scrutiny of not only the Voynich Manuscript, but also the life of Roger Bacon. This increased awareness of the known facts of Bacon’s life ended up resulting in string of unintended consequences, which eventually hurt Newbold’s reputation, and sent the Voynich spiraling, unidentified, into a scholarly limbo. By 1928 Wilfrid Voynich was in poor health, and almost broke. He borrowed thousands of dollars, and was unable to sell the Voynich, or any of his greater remaining works. When he died in 1930 everything passed to his wife Ethel, who relied on her trusted friend and longtime employee, Anne Nill, to keep the business afloat. Herbert Garland continued to run the London shop, but the Florence Libreria seems to have been disposed of just after WWI. Both Anne and Ethel never gave up hope they would be able to resurrect the reputation of “the Cipher Ms.”, and so, its value, and saleability, along with several other works they held. But of course, this never transpired, and the Voynich and other items were donated, sold and dispersed by the bookseller Hans P. Kraus, and are scattered in museums and collections around the world. Damning Traits: In the 1948 book Fakes by Otto Kurz, the author outlines many features and “tells” of forgeries. From this book and others on the history and attributes of forgeries, and how they were reacted to by the scholarly establishment, it has become clear to me that the Voynich Manuscript is practically a model case of forgery: Multiple varied and diverse expert opinion as to origin, content, meaning, and era; anachronistic content, including but not limited to possible modern optical devices, sciences, use of foldouts, imagery, celestial observations, animals, plants, even people; and poor and/or missing and/or contradictory provenance. There are many other, more specific, points which call into question the work’s authenticity, one example of which I will single out here: The 2009 McCrone tests showed that the ink of the last page marginalia, and the ink of the main text, are the same. However, it was previously understood that the writing of the marginalia is in a different “hand”, with different content, and presumed therefore from a different time than the main text. But this cannot be, since the ink is the same. So one would have to rationalize either that the tests are wrong, or misinterpreted, or that the marginalia was done at the same time as the main text for an innocent reason, and variations and combinations of those arguments, in order to claim the Voynich is authentic. Rather, this scientific fact is powerful, damning evidence that the marginalia is there for “effect” only, added by the same forger who wrote the main text. And there is even more, and more details to the above points, which support that this is simply a forgery… and in fact, not a very good one… and counter the claims that the work is any sort of genuine 15th century cipher-herbal, or any of the other similar claims from the time of the C14 dating to when Voynich claimed to have found it in 1912. Counter arguments: The idea that Wilfrid may have forged the Voynich Manuscript has long been one of great controversy. I had thought it impossible until about 2012, when various events and discoveries caused me to begin to consider it possible. Ironically, one major factor is because my critics pointed out that the optics I noted as comparisons were often “too new” for my early 17th century theories. I eventually agreed… they are too new, and I moved forward in time. In doing so, I began to see that all of the previously, seemingly, insurmountable “walls” to modern forgery were actually built on very shaky, and sometimes, non-existent, grounds. That is, much of what was known and claimed of the Voynich Manuscript, and of Voynich himself, turned out to be so mere speculation, and hopeful thinking. I list many of these in another post. It has also been claimed this hypothesis is too complex. Far from it, this is easily the simplest theory of all: Voynich found a stack of old calfskin, and penned a varied and enigmatic herbal of questionable quality and origin, using his wide ranging knowledge of literature as a rough source. He later used a scrap of blank paper to pen a supporting letter in imperfect Latin. After those simple facts, everything else fits. He had the materials, the access to knowledge, the ability and the motivation to do so. Conclusion: Although this was only a brief summary of my investigation, and resulting hypothesis, I hope it gives a good baseline of my arguments. Perhaps it will be “food for thought”, for those interested, and with an open mind, who are exploring this mystery for themselves. This entry was posted on March 23, 2016 at 11:54 am and is filed under codes and ciphers, Dating the VMs, history & provenance. You can follow any responses to this entry through the RSS 2.0 feed. You can leave a response, or trackback from your own site. I agree with you in one thing: that the inclusion of concertina-style fold-outs is so very atypical of fifteenth-century Latin European manuscripts that the inclusion of not one but several requires serious attention and serious efforts at explanation. I do not think that a modern European’s forgery is the only explanation possible and I simply cannot conceive that Wilfrid Voynich’s character was as you imagine it. Still, I read your posts, even if only because I see nothing to be gained by ‘Voynich censorship’, formal or informal. A further comment, Rich. The manuscript isn’t written on “calfskin” but on vellum. I’m not sure offhand how many languages might use the same term for both, but in English ‘calfskin’ refers to a type of leather (look up calfskin shoes, for example), whereas vellum refers to a skin differently finished, so that it can be used to write on. The difference is so basic that confusing the terms (as others have done in e.g. describing the vellum as ‘cowskin’) makes your argument seem less well-informed. Hi Diane: I’m editing this, because I see the point you make. You are not questioning the source being bovine, only that the actual term “vellum” should be used when the calfskin has been prepared to be written on. I misunderstood your point, and thank you for your input. Also, as you can see above, it was determined the cover is goat skin… but apparently not through the “protein sequencing”, but by other methods I’m not clear on. I do admit, however, to often incorrectly interchanging the term “vellum”, with both “parchment”, and “calfskin”. I have to catch myself sometimes, and don’t always do so, in time. Thanks for your input… Rich. Thank you so much for this. You have touched on most of the points I found in my own study of the VMs, that led me to believe that the VMs is a forgery by Voynich and his assistants. I even suspect his wife’s involvement but you don’t address that. It bothers me to see the continuation of misinformation on the websites of important researchers, but being the internet, that info will probably remain there forever. Or until someone publishes the best-selling book that proves how the ms. was forged (thereby shattering the dreams of those who hoped to win fame and fortune by breaking the code or such). Hi Lyn: Thank you for your feedback. As for Ethel knowing, and for that matter her friend and assistant, Anne Nill, I do not believe they knew this was a forgery. I’ve of course read all the letters I could find: In the Grolier and Beinecke archives. In them, I see two people who desperately wanted to solve the mystery… not only for the obvious value of the manuscript if it could be defined, but also out of the same passion for solving it that we all have felt. Ethel does not seem to have embraced the effort until after Wilfrid died, however. Once she did… according to Anne… she became hooked. As you probably know, I found her personal notebook of plant identifications at the Grolier (it is scanned, and online as a PDF). And Anne herself filled a notebook with characters and their possible meanings. These, and many other letters and activities, are not the actions of persons who knew they were working on a fraud. That being said, these two women clearly “steered” the access to, and reporting on, the manuscript, to a more favorable outcome. The “protected” it as a Roger Bacon manuscript… an outcome the both desired and believed in. I do think these efforts were also colored somewhat by the belief that a Bacon authorship determination would also be the most valuable… but that is as far as I would go to criticizing this unfortunate pair: They were enthusiastic about one outcome, and protected it, possibly to the exclusion of a less favorable truth. But Anne’s time would have been better served building a life for herself, and Ethel, in her music and writing career… which Anne noted, took a back seat to the Manuscript mystery… so like many, I see them as victims, too. Also of note is that I sensed Ethel was critical… in private… of some of Wilfrid’s conclusions (again, after his death). In one set of notes, she listed some of Wilfrid’s claims, and wrote on one, “How do we KNOW this?”… underlined, three times. Now as for Hubert Garland (manager of the Shaftsbury Office), I do wonder if he suspected, or outright, knew. Anne and he had a long friendship, and wrote throughout the 1930’s to each other. I can’t know, but have a general sense that he was reluctant to help Anne with her “problem” too much… that he held back to some extent. I read this as possibly his belief that she was better off thinking it was real, because then she would realize a great profit, etc., etc…. so why would he ruin that? It would be like robbing her of her, and Ethel’s, main chance at a comfortable retirement. As for a book, yes, that will be nice. Whether it is a best seller or not, we will see. But I do feel I have enough… even though one can never really finish a project like this, there is a point when the circumstantial case is so overwhelming for forgery (despite the vehement, passionate and insistent claims to the contrary), that such a book can and will take that position. But as for shattering the dreams of others, who believe this is real… well solving it, maybe… but if it has meaning, and if it is solved, they will only be finding out what we know already, right? So it will save them that, at least, then everyone can go fishing instead. Thank you for your detailed reply — I have not read Ethel’s letters but have based my opinion on her long and probably always close association with Wilfred even before marriage, that she and he had both travelled across Europe looking for materials to publish related to their revolutionary activities, and that she herself was a prolific writer, a translator and adept in multiple languages including, I’m guessing, the cyrillic alphabet. So far, reading your website, I haven’t found any points that I disagree with and will defer to your opinion that Ethel wasn’t part of this. However, since it seems agreed upon that at least two people were involved in writing the script in the ms., meaning that, in my opinion, someone (or someones) close to Wilfred that he could trust did this. Do you know of any individuals other than Ethel that might fit that description? Would Hubert Garland be a suspect? Of course, if Italian forgers made this book using materials supplied by Wilfred, they might not have been aware of how the ms. was promoted in English-speaking countries. But how could Wilfred be sure that he wouldn’t ever be outed or blackmailed by these people? Oh dear, I thought I was finished with this and now find another mystery that I need to pursue. No need to defer to anything I posit… there are of course many possible ways this all went down. I don’t hope nor expect to alter anyone’s opinion on anything, this is a personal quest, which I share for those interested in watching it play out. Maybe Ethel knew, or strongly suspected, although I would be surprised. He was “managing” the Libreria for a couple of years. Since it was closed for the summer season, it is reasonable to consider he had much time on his hands. He was really using the store as a sort of safe house, as his real background was a revolutionary, as Wilfrid and Ethel’s was. Maybe he helped pen the Voynich, and is the “second hand” in the writing. The main writing, I believe, and the illustrations, were the work of Wilfrid (although this is part of the working hypothesis, and I might change my opinion on this). First of all, it is not all that good… despite what the Genuinists would want one to believe, many have thought this a somewhat amateurish, even childish, work. I’d call it “cartoonish”. Long before I came on the scene, in fact, others have noted that the artwork of Voynich’s created “cat/rat” Sessa logo is of a similar level of badness, and similar style, to the animals in the Voynich. Only guessing here, so don’t quote me: I think it possible that when Voynich bought the Libreria in 1908, any talented forgers were long gone… the son had owned it for a couple of years after the death of his father. If it was a forgery shop, perhaps the artists drifted away. But the other works I suspect as forgeries, owned and/or sold by Voynich, may have been found on the premises. Like the Voynich Ms., they have little, bad, or no provenance; they are historically unknown, and have art historical anomolies. And, later, were all attributed to a lucky purchase at the Villa Mondragone. So I tend to think that the Voynich, if a work almost entirely by Voynich himself, was the only one he made. It may have been a whimsical exercise, that got out of control… or a little joke to play on his bookdealer friends, or something to share with his young daughter, while visiting Florence. Perhaps, I also speculate, at some point he was somewhat surprised it “passed muster” as a real work… and so, why not try and push it as such? Sort of like a lie that got out of control, and was never found out during their life… nor, bizarrely and incredulously, long after. That would take the perfect storm of literary and art history blindness… which I think happened, and is happening still. Hello! Have you seen this article – https://arxiv.org/ftp/arxiv/papers/1604/1604.04149.pdf? I am very sorry for my poor English… But I hope the content is understandable. Hi Alex: Thank you for your interest, and for linking that article. I read it through, and can tell you that it is very typical of dozens of such “translation” claims I have seen over the 8 years or so, some published and famous, but many not well known. I can tell you with certainty that this is not a translation/decryption/decoding of the Voynich… or more accurately, there is nothing in it that can be determined to be correct, and if it is, it would be purely by chance, with no way for a third party to know if it is correct or not. That may sound harsh, but it is not intended to be. And I fully expect that whomever wrote that, if they read my review of it, will think me wrong, and will continue with their belief that they can read the Voynich. That happened every time so far, with translation proposals in English, Chinese, Korean, Latin, Walloon, Old English, French, Czech, and others. For code and cipher and artificial language systems proposed… for recipes and poetry, for biblical works, for alchemical formulas, for nonsense. Every language, every meaning, in every combination you can imagine, has been proposed as a “solution”, and they all fail, as this has, too. Why? Because it is a valuable human asset to be able to discern patterns in the incomprehensible. But when this ability is unchecked by the equally important ability to be introspective about the failings, then the person involved will continue to believe they have succeeded, and not give up on their belief they have. 1) Be repeatable by others who only know the system. That is, a second party must be able to resolve the same results as the proposer of the translation. 2) The results of the above, the “plain” text, must make sense in some context. OK… that was good. But then, statements like this immediately crop up, “The first my assumption was that VMS is not a forgery.” So now, they have assumed it is not a forgery, so then all their work after that is based on this assumption (and many others). That is, they decided it is not a forgery, so the path, conclusions, and results will not allow it. They have shackled themselves to this, and are therefore limited in the possible outcomes. The author now arbitrarily, and based on speculation, limits themselves to only 50 year out from the date of the vellum! Which is in itself an error based on misinformation, as the range of dates for individual leaves of Voynich vellum actually extends 60 years from the “average”, and the error range, much further. So in fact, the authors arbitrary “45-50” years, based on faulty research, is not even as forgiving as the data! That is, they could add their 50 years to 125 years (error margin) out, and include possibilities to the mid 16th century… based on their own reasoning, and actually, as I said, based on the historical use of old vellum, out to 1912. And in the above, he is also making the assumption that there was not one person who invented a system outside of the “state of the art” of cypher practice of the time… when it is known that many such individual, often unpublished, inventions have happened, in this field, and really, in any other: That is, it is one thing to estimate the possible systems used, but another to assume they are the ONLY systems known, and therefore, dangerous to limit oneself to them. So there we have several errors compounding on each other: The date of creation of the text is assumed; that assumption is based on error; and that assumption is incorrectly used to limit the possible cyphers used for the text. But then they cover all ground, all possibilities to explain why they cannot really, in the end, prove anything… it is either “modified or simplified” English, or even, “…one of English dialects”. Then, after that, many special characters, and characters having multiple uses… giving the author much leeway in error, in opinion, in results, in reasons for failure beyond a certain point. A key sign of incorrect translations/decryptions is that the “method” proposed has so many variables included, that really any result can be obtained. After these claims, there are dozens of pages of special rules and disclaimers, showing how many characters can have multiple uses and meanings. This is very common in such failed translations. “Of course anyone can start now to read the text of VMS. But it is still requires to understand the complete principles of coding”. Well, no… either you have the method, or not, and if you have it, others will be able to independently decipher/decode it. This is a common claim of these “translations”, that if others cannot decypher it like the proposer can, then they simply do not fully understand the method. The decyperer has fallen into a common human trap: Failing to see that the answer is purely subjective, to them, and no one else. Ciphers DO NOT WORK LIKE THAT. And so on, and so forth… the paper is rife with such errors of judgement, errors of fact, lack of a usable system, vast variations used on coming to the limited and senseless “translations”. I could really go on, point by point, but you or anyone reading this will get my point: There is nothing here at all, no translation, no system, no proof. But the author… should they happen to read this, can take comfort: They are far from alone. I could and have written almost the identical critique to at least a dozen systems proposed to me, and realized it of at least two dozen more, but kept quiet, as I was not asked my opinion. And I offer the above as good advice, which perhaps the author will take to heart, be introspective about, and save themselves much precious time in life and realize they are on the wrong path here. But if they do, I’m afraid, it will be the very first time. Many thanks for your reply and criticism. It was difficult for me to wrote it in English because of my poor English. As well as because of my main business. That explanes why you are not see the fundamental preview. In Russian version there are moredetailed explanation from my site. It is very easy to verify my search. Just go to the page 57r – with diagram and try to apply codes. I am receiving many letters with request to translate ten’s of pages, but that is very difficult in short time. I am looking for the partner with whom I can continue the reseach. I realized that after I posted my response… for some reason I thought one of you was a Michael, sorry… my bad. I have to say, though, that you have added another layer of explanation, this time as to why I would be wrong in my assessment: That you and I have a language barrier, and therefore I cannot see all of what you propose, and probably, not understand the parts I do see. You may or not accept this, and that is up to you: But there is more than enough here for me to fully understand the type of claim made, the fundamental basis of that claim… how you got there… and the disclaimers given for its faults, in order for me to more than realize that your path is in error. You seem like a great guy, and I appreciate your patience, and I am only being honest with you, and hope to assure you that I do understand, I do know what has happened here, in order to save you a great deal of time and trouble. But like I said, I have never seen any author of any of the very many similar claims, even some with more basis, or equal basis, as yours, accept my opinion. I get that. You would not be there now, if you did. A prize fighter never retires, even when they cannot win, very much because they have that thing inside them that says, “Never give up”. So I don’t expect to influence you… but maybe you can pick another fight; i.e., try another way. Maybe you are the person to solve this… but I know it is not with this path, so you would have to first give it up, and pick another. It is very difficult for me to be along… Because of that (if you interesting) my proposal to you to be my editor, critic and probably producer. The main prize I receive – a lot of young people (as well as my sons) and many readers and friends in Russia and in Europe changes their minds about me and about history. Many of them switched from PC to real history. That is best that you can expect. It is a wonderful aspect of this, that although you and I, and almost everyone else, all disagree on most points, that it gets people interested in the history of literature, and history in general. I’ve investigated the history of Shakespeare, and the court of Elizabeth I, James I, and their courts… the history of science, of cipher, of much more. And also, met some of the most extraordinary, knowledgeable and nice people in the world. So whether we are right or wrong in our ideas, we have already won. Just want to say – that I very grateful to you for all comments. It helps me to try to find a solution to convince people or to ensure that I am wrong. In addition – have you seen the chapters (8-11) dedicated to the text of last VMS page? 1) There is far to much variation and personal speculation for any of your proposal to be known to be correct. 3) You do not give a system for others to follow, in order for an independent party to come to the same results as you do. That is, anyone can… and actually has… imagine an infinite number of alternate interpretations to the text here, other than yours. 3) Are you aware that the ink of the last page marginalia is the same as the ink of the main text? The McCrone report has determined this. So considering that, why would you think the last page text is different, or in a different method or content, than the rest of the text? Re inks of last page. It can be different because initial were finished. Nobody did the full analysis of ink from all pages of manuscript – only few pages were selected. There is not enough for good statistics. By the way – electron microscopy, EDS and XRD (inks were possible to analyze only by these methods – nothing useful for date investigation, but only valid for chemical composition analysis) – are my main occupation. No doubts – you can be right. As I mentioned – I need the supporter to resolve questions you’re passed to me. If you will explained in more details what I have to provide – I’ll try to find the answers. 1) Repeatability: You find a way to describe the underlying system of encoding/enciphering, so that anyone who you give that system to can use it, to come up with the same results you have. 2) Meaning: The above must produce meaningful text. It is really as simple as that. There cannot be any ambiguity, such as “only I” can make the translation, because “only I” can understand how to apply the system; there can be no multiple results, such as one person getting “Cook the broccoli five minutes”, and another from the same text, “Free the bunnies”. And the results have to have meaning, because even if #1, repeatability, is met, it matters not if the common results are, “tree tree tree run toad toad fungus Tuesday”. If you achieve repeatability and meaning, you have solved the Voynich. If not, you have had a lot of fun, or not, as the case may be! All you have sad – true. I’ll do the things a elation of different parts of manuscript to confirm that codes are works. Recently there have been some strange Voynich-related artifacts popping up that might tie into your modern forgery hypothesis, and I was wondering if you had seen them. One of the strange artifacts is an apparent copy of f14v of the VMS recently bought by a certain Fabrizio Salani from some book dealer in Italy. The replica is definitely intended to be a copy of this page of the original VMS, there is no doubt about that. But why there are a number of errors and discrepancies in the copying of the plant and the characters (especially the bench characters, the altered style of the plant roots, and the addition of an incorrect page number), and why and when and by whom this copy was made in the first place…remains a mystery for now. Oddly enough, the copy is written on parchment that Fabrizio Salani had radiocarbon dated, and the result apparently came up as “the first decades of the 20th century” (according to posters on Voynich Ninja). REALLY strange, no? Why would someone have been making replicas at that point in time…and on parchment! Could this have been a thrown-away trial run of this page of the Voynich, done by the author (forger) of the VMS before he/she/they had gotten fully confident with writing the Voynich characters? I tried googling this Fabrizio Salani to see if I could verify anything about the purported provenance of this replica, and to no avail so far. Maybe you would have better luck than me at inquiring into this further. Once again, I have not had luck following up on this and nailing down there this piece of parchment came from. Of course, this website itself offers a spurious translation that can be safely disregarded…but the question remains…what is this, and where did it come from? It clearly has characters on it that are not known from anywhere else aside from the VMS, especially the gallows characters and the “r” character. Hi Citizen! I am sorry I didn’t get back to you sooner. Thank you for the interesting links. I had actually been privately informed of the Fabrizio Salani page a few years ago, when it was presented to a friend. That friend was asked to keep its origin secret, which he did… but he was told he could share an image of it with some researchers. “I made a 30% transparency of the image you were sent. I then made a layer over the original Voynich f14v, and placed the 30% transparency over it. I wanted to see how they related. “In “XXXXX_1.jpg”, I aligned the leaves. As you can see, they are very close… as though they were traced. The serrations line up almost perfectly. “In “XXXXX_2.jpg”, I aligned the root. Now you can see that the root structures line up very well, until some “imaginative” additions! “I think this copy was made on a light table, from a copy of the Voynich. I think someone printed out f14v, placed it on a light table, and put the material your copy is on, on top of it. I think they then traced it out, but moved their copy around, to better fit the size and proportion of their copy. I think they moved it at least three times: To place the leaves, then the roots, then the text. Each time, they then added details to it, such as the extended roots, to better fit the page. “I do not think it is a projection on the copy material. There is no distortion, only movement. I do not think there were light tables in the 17th century, but I could be wrong. Perhaps, if geniune, the sheets were place on a window. But then it would be hard to ink, being vertical, and also it would be attached, making it less likely that the copiest would remove the copy sheet three times to fill the page. “Also, since there is much information on f14r, it would make it much harder to trace your copy, on a light table, using the original page. The information from f14r would complicate the process. “Also, since f14v was presumably bound into the Voynich book, it would make it much harder to place the page on a light table, or a window, FLAT ENOUGH to make a good tracing. As for the others, yes really interesting… and I would like to borrow the links and post them to the VMS-list… I’ll link to this page, too, so they can see you suggested them, and your comments. And thank you, again, for your interest. Rich. I’m just a layman, but what bugs me most is this particular aspect: “Voynich found a stack of old calfskin.” What, just like that? What are the chances of just happening upon copious amounts of vellum, perfectly usable even though half a millennium old? I realize Voynich bought up large stocks of antiquarian books, so he would be among the more likely people to discover something like that, but how likely was it really? Had it ever happened in other circumstances? Seeing that carbon dating had not yet been developed yet, did he have any incentive to use old vellum, could have not have used relatively recent one instead? 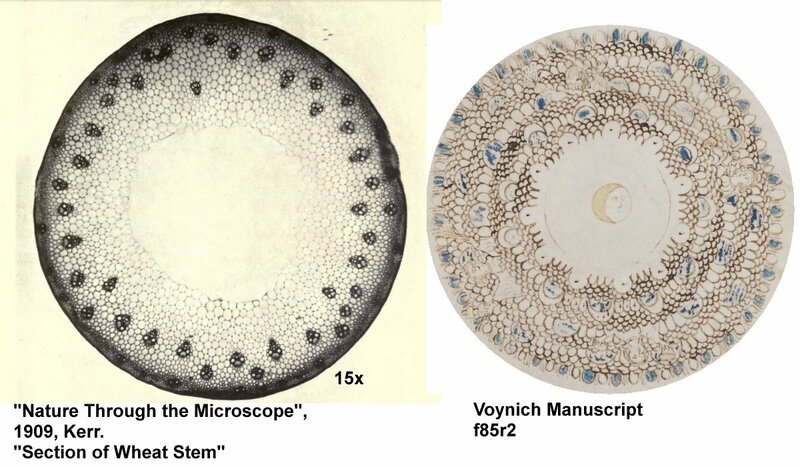 What strikes me is that if Voynich really did forge the VMS, it must have been such a singular occurence in his life, and yet a display of considerable talent and amazing attention to detail. Peter, I am sorry I didn’t note your comments and questions for so long. I only notice it now, while approving another comment. Actually it was “just like that”. Voynich purchased, in 1908, the Libreria Franceschini. It contained a reported trove of a half million items: https://proto57.wordpress.com/2011/02/26/something-sheepy-in-the-state-of-denmar/ It is easy to imagine enough blank sheet among all those piles, to complete “a” Voynich Ms. There are many examples of forgeries being made on blank materials, and other materials. Most noteworthy are the many Mesoamerican forged codexes, created on that blank bark “paper” found in South and Central American tombs. Many forged paintings were made on ancient wood, and printed, written and drawn forgeries on ancient vellum and paper. “Seeing that carbon dating had not yet been developed yet, did he have any incentive to use old vellum, could have not have used relatively recent one instead? He could have, but it has been common practice, long before C14 testing, for forgers to use old materials if available. There are many reasons: For one, the difficulty in mimicking other signs of age convincingly… such as wear, natural degradation, staining, and so on. It was done, but there are many cases where forgeries were revealed by poor “aging” of new materials. The other point, implied by your question, is that if he used old blank vellum, he actually used the wrong age vellum, not the correct one. The vellum (calf skin really) dates do not match either his hoped for Bacon authorship, nor the great majority of expert opinions on the dating of the content. You can see my thoughts on these and many assumptions about the Voynich, addressed here: https://proto57.wordpress.com/2015/05/08/modern-voynich-myths/ Much of what people think of the Voynich are based on erroneous and/or unsupported assumptions. This is subjective, and I respect your take on that. But I disagree. While lengthy and detailed, I tend to think the work somewhat sloppy, in-artful, and untalented. There are others who share both our opinions on this… and those that agree with my position, usually have other reasons to explain it than I do: The work of a child, or a deranged person, or one on drugs… or just a bad artist. I just think Wilfrid was a bad artist, and made it. As history of science is a research area of mine I’ve remarked a fair bit of incongruencies in what the manuscript purportedly illustrates. You have a really good argument here, thanks for taking the time to write it. And thank you for taking the time to read and absorb it, and then to leave the nice comment. As for the history of science, I read The Structure of Scientific Revolutions last year, and was stunned to note many of the phenomenon outlined in that book, the principles and observations of the author, ran closely parallel to my experiences with the situations I’ve encountered in this Voynich investigation. I mean, Voynich studies could practically be used as a case example in that book, as to how a paradigm protects itself, and all the ways it deals with anomalies to do so. All the best, Rich. Could you possibly provide links other than your work (which is a blog, albeit an incredibly well researched one) so that I could make some changes to wikipedia? I know it may sound like a complete non-issue to you, but I’d appreciate an answer. One other item I just found in MANTOVA, PALAZZO DUCALE. Castle San Giorgio looks like the Voynich Castle. 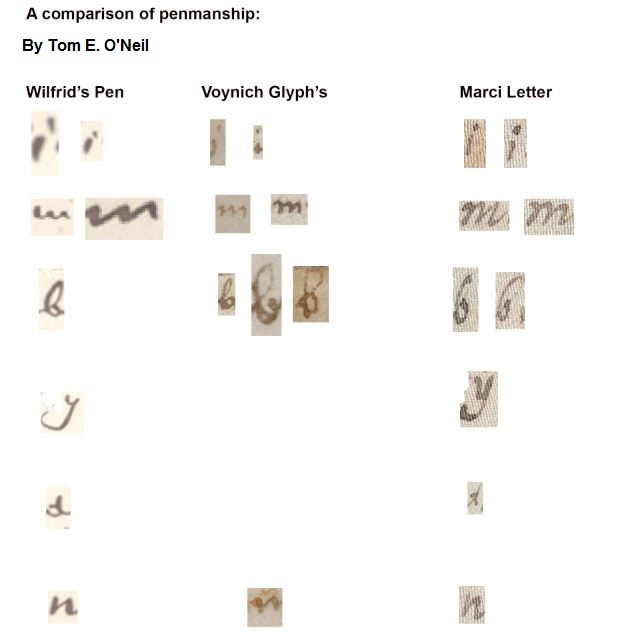 I did a letter by letter analysis of Wilfrid’s penmanship. Here is the conclusion.